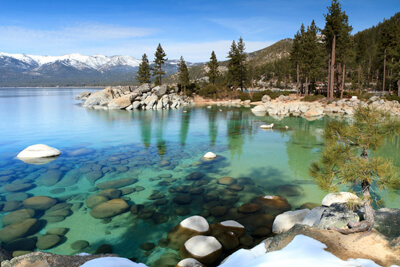 Surrounded by the jagged peaks of the Sierra Nevada and Carson Ranges, Lake Tahoe is known for its crystal clear water. Lake Tahoe is the tenth deepest lake in the world and the second deepest in the United States (only surpassed by Crater Lake in Oregon). This year-round destination offers something for everyone, hiking, biking, golf, a bevy of water recreation and winter sports, as well as great shopping, dining and relaxation all amid jaw-dropping natural beauty. This drive starts in South Lake Tahoe and travels in a clockwise loop around the lake, but of course can be done in either direction. You can reach South Lake Tahoe by US-50. Heading west on CA-89, consider stopping at the U.S. Forest Service Visitor Center (I1) for information on local hikes, including a few that leave from here. The Tallac Historic Site (A1) is near the visitor center and preserves cottages built in the 1890s when the area was a popular get-away for wealthy San Franciscans. Mount Tallac is visible from CA-89 a bit further down the road. In 6 miles, stop at Lake Tahoe’s Inspiration Point (V1) and Emerald Bay Overlook (V2) for stunning views of Emerald Bay, known as the heart of Lake Tahoe. Emerald Bay State Park and D. L. Bliss State Park (H1) are adjoined, and offer 6-miles of shoreline access, perfect for swimming, basking on the soft sand, fishing for trout or Kokanee salmon and scuba diving. Both parks have been designated an underwater state park and scuba divers can explore sunken boats, launches and historic barges. Near the Emerald Bay Visitor Center is Vikingsholm Castle (A2). Completed in 1929, the home was built using ancient Scandinavian methods and materials, and features period Scandinavian furnishings and art. There is a fee to enter which includes a guided tour. Hiking the Rubicon Trail winds from one park to the other revealing non-stop breathtaking views. In D.L. Bliss, take the Lighthouse Trail to discover a wooden lighthouse from the early 1800s and from Rubicon Point, gaze into Lake Tahoe as deep as 100 feet. The short self-guided trail to Balancing Rock explores the local flora and fauna through interpretive signs and leads to a precariously balanced granite rock. Camping is available from Memorial Day weekend until September 30th. Note there are bears in the area. There is a day-use fee for entry and these parks are closed for the winter season. If you’re traveling off-season, please check for seasonal closures for the points of interest along this drive. About 9 miles from D. L. Bliss State Park, Sugar Pine Point State Park (H2) is very popular for impressive views of the Sierra Nevada’s and Lake Tahoe. Comprised of 2,000 acres, explore the dense forest along the General Creek Trail, or take advantage of sandy beaches and camping. The biathlon and cross-country ski events of the 1960 Winter Olympics were held here. In winter you can channel you inner Olympian and enjoy cross-country skiing and snowshoeing. In 7 miles, you will arrive in Tahoe City, where the Gatekeeper’s Museum (M1) features Native American and pioneer artifacts. From here, consider a side trip to Truckee Canyon (T1). The trip follows the Lower Truckee River through the canyon, passes two world-class ski resorts including the site of the 1960 Winter Olympics, Squaw Valley, and ends in Truckee where you can reach Donner Lake and Donner Pass. Continuing north on CA-28, the road is more developed for the next several miles. In Kings Beach, stop at the Kings Beach State Recreation Area (W1) where you can enjoy 700-feet of sandy beachfront. The shallow shoreline makes it a great spot for kids. Known as the north shore’s banana belt, it lies in the sun’s path for most of the day and here you’ll find everything you need for a perfect beach day, including on-site paddle-board, kayak, jet-ski rentals. After leaving Kings Beach, the drive heads into Nevada where you will soon reach the Lake Tahoe Nevada State Park (H3), an ideal location for hiking, boating, fishing, swimming, and picnicking. Sand Harbor offers beautiful views of the Sierras. The sandy beach, rocky coves and outcroppings make this a popular stop. Consider taking the East Shore Shuttle from Incline Village during peak season. A few miles south is Logan Shoals Vista Point (V4), where panoramic views of the entire lake are enchanting. It’s no wonder why this is a popular backdrop for wedding photos. Heading south, the road becomes US-50. Stop at the Cave Rock Overlook (V3) to observe caves carved by crashing waves into the volcanic rock. The Cave Rock area is sacred to the Washoe Tribe and is now closed to climbers. US-50 continues through Cave Rock Tunnel. Zephyr Cove Beach (W2) features several miles of sandy beach and magnificent views of the Sierra Nevada Mountains. It is also one of the only dog-friendly beaches in the area. Shortly after Zephyr Cove, the drive crosses back into California. Take the 2.4 mile trip up the Heavenly Ski Resort Gondola (V5) for unparalleled views of Carson Valley, Desolation Wilderness and shore-to-shore views of Lake Tahoe. Get off at the Observation Deck where you can enjoy walking trails before heading to the top. South Lake Tahoe marks the official end of our scenic drive, but there is much more to do. Visit one of the town’s three beaches or learn about the region’s history at the Lake Tahoe Historical Society Museum (M2). From here, consider heading through the Sierra Nevada mountains on Ebbetts Pass by heading south on US-50 to CA-89.